Berlin, San Jose, 25th September 2017 – The Java Card Forum (JCF) is delighted to announce that jNet ThingX (“jNet”), a technology innovator specializing in the development of secure, embedded operating systems for secure microcontrollers (i.e. smartcards) and resource-constrained SoCs, is joining the Java Card Forum, demonstrating its commitment to contribute and drive forward the development of an IoT profile for the Java Card specification. Over the past 3 years, jNet has been working with customers to evolve and adapt its Java Card solution to address the requirements of IoT edge devices. Building on Java Card’s strong security foundations, jNet added support for multiple communication protocols, sensors and actuators, including real-time processing of I/O and sensor fusion, secure remote updates, and more, to address the full set of requirements from the SoCs that go into IoT edge devices. The primary purpose of the Java Card Forum is to promote, as an industry, the development of Java as the preferred platform for interoperable smart cards and other secure devices. The Forum was founded in 1997 and is composed of a Business Committee and Technical Committee, advancing the Java Card specification in cooperation with Oracle. 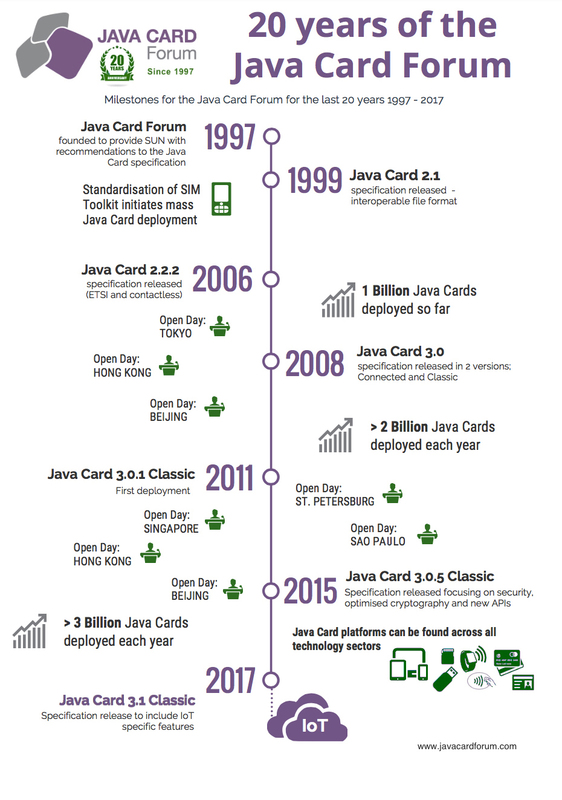 The Java Card platform is now one of the most pervasive technologies in the world. 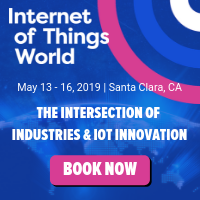 jNet ThingX is a “technology enablement” company in the business of developing secure Java Virtual Machines and mission critical, native, real-time Operating Systems under contract with silicon manufacturers, government agencies and commercial businesses. Using its Java Virtual Machine, jNet helps its customers by abstracting away the complexities associated with development on resource-constrained secure microcontrollers and SoCs. As a result, jNet customers reduce their development costs, accelerate their time-to-market and benefit from robust security. NXP Semiconductors N.V. (NASDAQ:NXPI) today launched its latest Java Card Operating System, JCOP3, for secure identification applications. 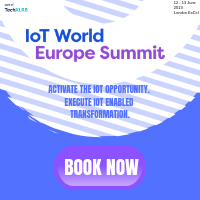 Customers can benefit from a multi-solution platform with higher security and flexibility, as well as the ability to integrate their own applets and personalization solutions, while accelerating time-to-market. Coinciding with the twentieth anniversary of the Java Card Forum, the launch of JCOP3 is part of NXP’s comprehensive offering that marks a new level of convenience for the identification market and underscores the continuous innovation in Java Card technology. 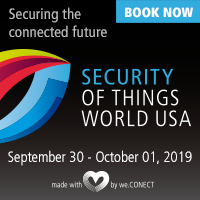 In a world of connected things, an increasing number of contactless applications and an all-time high of security attacks, there is an increasing demand for solutions that harmonize security, flexibility, and convergence — without sacrificing any of these capabilities. NXP’s latest JCOP3 product is based on the SmartMX2 microcontroller platform and offers both EMVCo and Common Criteria certification Features such as NXP’s unique SecureBox solution allow customers to develop native functionality that seamlessly runs on the JCOP3 platform with outstanding performance. NXP also collaborates with numerous partners who offer a reliable and proven eGovernment Suite. Building upon NXP’s successful and field-proven JCOP2 product family, NXP’s JCOP is optimized for fast, highly secure and flexible identification solutions, making it the Java Card-based operating system of choice. NXP’s JCOP product family delivers outstanding features and performance as one of the most used Java Card–based operating systems in government programs around the world. More than a billion units have been sold for payment and government applications to more than 80 customers in 50 different countries, making Java the preferred programming language for secure multi-application smart cards. NXP has been a member of the Java Card Forum for more than ten years and joins in the celebration to mark Java Card Forum’s twentieth anniversary. NXP collaborated with the forum on the first JCOP development with Java Card Forum IC technology in the early 2000s. NXP has also been leading the technical committee as well and driving the technical specification work for over five years. During this period, the Java Card specification 3.0.5 was successfully released. The Java Card specification 3.1, covering IoT requirements, will be released next year. NXP Semiconductors N.V. (NASDAQ:NXPI) enables secure connections and infrastructure for a smarter world, advancing solutions that make lives easier, better and safer. 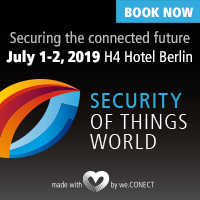 As the world leader in secure connectivity solutions for embedded applications, NXP is driving innovation in the secure connected vehicle, end-to-end security & privacy, and smart connected solutions markets. Built on more than 60 years of combined experience and expertise, the company has 31,000 employees in more than 33 countries and posted revenue of $9.5 billion in 2016. Find out more at www.nxp.com . NXP, JCOP, SmartMX and the NXP logo are trademarks of NXP B.V. Java and Java Card are registered trademarks of Oracle and/or its affiliates. All other product or service names are the property of their respective owners. All rights reserved. © 2017 NXP B.V. When it first started, the JCF used a simple coloured logo that could be easily identified at a glance, with a basic site layout – remember this? As the Forum became a wider reaching industry organisation, it was felt that a more “professional” image was required and in the Summer of 2005 a new Look and Feel was released, celebrating the colours of the logo itself. After 15 years of using the same logo, the members felt it was time to re-brand the Forum and in November 2013 a totally new look was unveiled at the CARTES show in Paris, demonstrating the commitment to the future of the Java Card platform. Remember Card Technology magazine? It was THE publication for the smart card industry with journalists like Dan Balaban and Thad Rueter digging for the truth. There was certainly a lot of coverage concerning Java Card over the years, and even a cover story featuring Bertrand du Castel (first Technical Committee Chairman) as “Visionary of the Year”. We have the text from one of Dan Balaban’s articles entitled “Java Card and the new era for smart cards”, published in Card Technology Issue November 2004, Volume 9, number 12, where he discusses how the Java Card platform is set to revolutionise the usage of smart cards in the future. 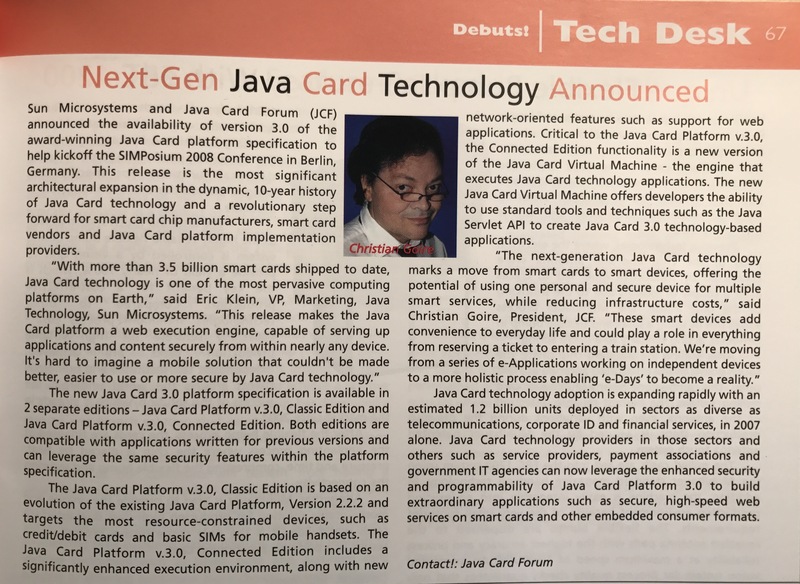 The JCF also received coverage in Card Technology Today and CardsNow!Asia about the enhancements to the Java Card specification with the 3.x release. There was a real sense of excitement with the new release, as the platform could move beyond the standard smart card environment to a variety of different form factors. Those involved in the Forum have also documented their personal opinions about the technology, the companies involved and the industry. Eric Vétillard, who took over the post of Technical Chair from Bertrand, has been writing a blog for many years now, entitled “On the road to Bandol”: http://javacard.vetilles.com (Bandol being the internal name that was given to Java Card version 3.0 within Sun – as well as a French town). Here he shares his personal views on Java Card technology and now more recently, the IoT market. He has also provided some Java Card tutorials: http://javacard.vetilles.com/tutorial/. We’ve even dug into company archives to find some of the Press Releases from the early days, including the very first Press Release about the formation of the JCF. “Over the years, we have been very active in the Java Card Forum, as we consider its contribution to be a major building block for the telecommunications market,” said Yves Portalier, Vice President and General Manager of the Telecom Business Unit at Safran Identity & Security.